What happens when you want to 3D print something that must interact with the real world? The Encore project makes it possible to 3D print objects that must attach to things in the real world. Encore provides an interface that, given an imported object and a chosen attachment method, visualizes metrics relating the goodness of the attachment. In addition, once an attachment type and location is chosen, Encore helps to produce the necessary support structure for attachment. Encore supports three main types of attachment: print-over, print-to-affix, and print-through. Print-over attachments are printed directly on the existing object. This works well if the object is flat enough that the print head won’t encounter obstacles as it moves, and the object is made of a material that the printed material will easily adhere to. Encore helps by finding a rotation of the existing object that minimizes obstacles, and generating support material to hold the existing object in place. Printing a magnet holder over a Teddy bear toy. Left: printing an LED casing on a battery to make a simple torch; right: printing a handle to an espresso cup. An alternative that is useful when the existing object does not fit on the print bed is print-to-affix. In this approach, the attachment is designed to fit snugly against the existing object. It may be glued in place, or can include holes for a strap, such as a zip tie. Left: printing a structure to make a glue gun stand; right: printing a reusable four-pack holder. Encore is implemented in WebGL. It supports importation of an existing object, selection of an attachment, and then lets the user click to indicate where the attachment will go. Given this information, it uses geometric analysis to compute metrics for goodness of attachment, such as attachability and strength. Encore visualizes them using a heat map so that the user can adjust the attachment point. Encore visualizes which parts of a wrench are more attachable when printing over a handle. 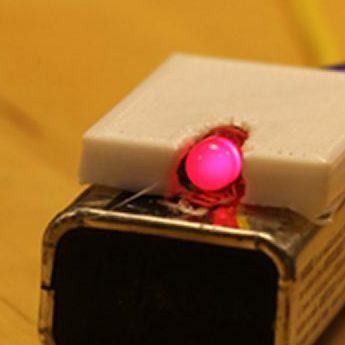 Using print-through to make a key ring.